Nestled in the Appalachian Mountains of Western Maryland, Garrett County is definitely off-the-beaten-path. But that’s not a bad thing; in fact that’s part of its charm. It’s a pleasant place to wander along the country roads, enjoy the scenery, and just take in the wide open spaces dotted with family farms and forest land. Thanks to the Barn Quilt Association of Garrett County, you can now also enjoy a gaggle of quilt barns throughout the county. And since you don’t even have to leave your car to enjoy this slice of Appalachia, it’s a great choice for wheelchair-users and slow walkers. The whole quilt barn concept began in Adams County, Ohio, when Donna Sue Graves painted a quilt square on her Ohio tobacco barn to honor her mother. Somehow the idea caught on, and soon Donna’s neighbors had quilt squares on their barns too. Subsequently a map was printed, and the first quilt trail was born. Today there are quilt trails in over 30 states, and although they all follow the same basic recipe, each trail has a decidedly different flavor. The Garrett County Quilt Trail features barns and quilt designs that showcase the Appalachian tradition and heritage of the rural county. And I guarantee you’ll be drawn into that heritage as you wander the country back roads in search of the coveted barns. To that end, the Barn Quilt Association of Garrett County developed a quilt barn map and brochure (garrettbarnquilts.org/…brochure.pdf). It contains the addresses and GPS coordinates for over 20 quilt barns throughout the county. That said, it’s best not to totally rely on your GPS; in fact, a good map and a keen eye are preferred over modern technology in this neck of the woods. The association also developed a cell phone tour that can be heard at (301) 501-5063. Although cell coverage can be spotty in some parts of the county, the tour is very informative. Just punch in the barn number, and you’ll learn more about the history of the barn, the quilt and the farm owners. Quilt Barn hunting is fun, but remember to take time to enjoy the scenery along the way. Consider it a giant treasure hunt, and don’t get frustrated if you miss a turn or can’t find a barn. And don’t forget to check the Barn Association of Garrett County’s website before you start your adventure, as new barns are added all the time. To whet your appetite, here’s a sampling of the treasures you’ll find along the Garrett County Quilt Barn Trail. Located at 5440 Sang Run Road in McHenry, the Delectable Mountains quilt square is prominently displayed on a 1962 milking barn owned by Greg and Kathy Hinebaugh. The red and green quilt square really stands out on the whitewashed barn; in fact, it can be seen from some distance. The pattern was a favorite of Greg’s mom — it’s one that she made many times — and it was selected by the Hinebaughs as a tribute to her. Just down the road at 4067 Sang Run Road, you’ll find the Original Applique quilt square on Frank France’s big red barn. The barn was built in 1951 by the previous owner, George Browning. At one time there was also a Native American camp near the Youghiogheny River on this site. The quilt square, which depicts that camp, was designed to celebrate the cultural heritage of this tract of land. The Flying Geese quilt square is located at 4067 Sang Run Road, on the side of the historic Friend’s Store. This land was originally settled in the 1700s, and the store has been a central point of contact for the Friend family for over 100 years. Although the store is now closed, back in the day it carried staples and traded ginseng for the locals. The old gas pump still stands in front of the store, and it’s a nice place to get out and walk or roll around. Up north in Friendsville, Sallie’s T quilt square is located on Reed Rodeheaver’s barn at 100 Bishoff Road. The barn has seen some hard times in recent years, and a massive snowfall in the winter of 2009-2010 caused a large section to collapse. The orange, yellow and white quilt square that appears on the side of the barn is sponsored by Robert and Evelyn Hugueley, in memory of Evelyn’s mother Sallie. An avid quilter, Sallie loved this pattern and used it in many of her creations. If you wander on down to Oakland, you’ll find the Love Ring quilt square on the side of Ray and Rachel Miller’s barn at 1689 Pleasant Valley Road. The red and white cow barn was built in the 1900s, and the farm has had many names over the years. When Ray retired from his roofing job, he renamed it Duntrussen Holstein Farms, as he declared he was truly done with his roof trussing days. The quilt square is one that was included in the quilts made by Rachel’s mother for each of their seven children. This Amish family also owns Pleasant Valley Dream rides, a horse-drawn carriage and sleigh ride business. If you’d like to linger on a bit in Garrett County, the Wisp Resort (301-859-3159, www.wispresort.com) is a good pace to base yourself. It’s centrally located in McHenry, and although it’s known as a ski resort, it’s also a pleasant place to stay in the spring, summer and fall. There’s plenty of accessible parking in the lot out front, with level access to the building. The front entrance has automatic doors, and inside there’s barrier-free access to the front desk. 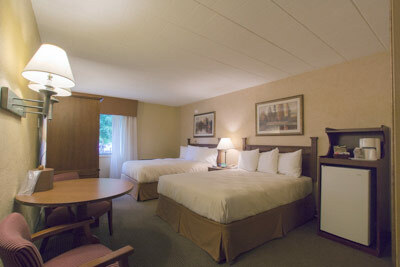 Room 116, which is located on the ground floor, is a good choice for wheelchair-users and slow walkers. It’s furnished with two 23-inch high queen-sized beds with wheelchair access on both sides, a desk, a table, an armoire, two chairs and a refrigerator. The bathroom has a wide doorway and it includes a full five-foot turning radius. 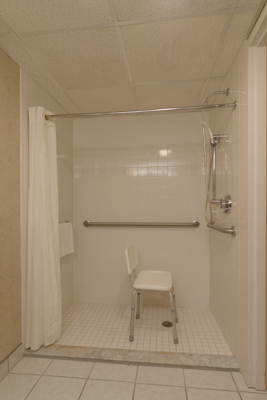 It’s equipped with a roll-in shower with grab bars and a hand-held showerhead. 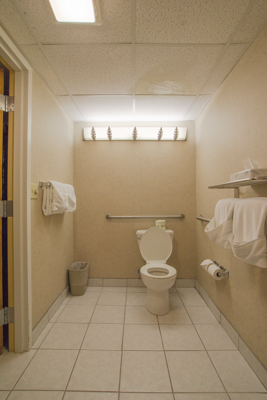 The toilet grab bars are located on the back and left walls (as seated), and the bathroom also has a roll-under sink. A portable shower chair is also available. Additionally, there’s barrier-free access to the front lobby and other public areas of the property. All in all, it’s a good place to call home for your quilt barn expedition, as it’s a clean property with good access and a very accommodating staff.